Elliott Hoye is aiming to thrill the Portsmouth Guildhall crowd at Shock N Awe 28. The flyweight meets Frenchman Abdel Lif in the co-main event of the bumper card on Saturday. Hoye, who trains out of Fratton’s Gym 01, is bidding to take his unblemished professional record to 3-0. 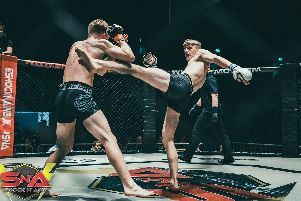 The 21-year-old heads into the contest against Lif (3-2) on the back of a third-round TKO defeat of Luke Shanks at BAMMA Fight Night London in June. Hoye is confident of delivering another victory – and hopes to entertain the Shock N Awe spectators in the process. The Brighton talent said: ‘I’m excited for the fight. It’s the 10th Shock N Awe show that I’ll be on. ‘People have sent me videos of the venue and it’s crazy. It’s the biggest venue I’ve fought at, so I’m looking forward to it. ‘I haven’t been working on anything too specific. I’ve had so many pullouts in the past that I never focus on anything specific. ‘Hopefully I’ve made some big improvements and we’ll wait and see what happens. ‘I was trying to get into the main event! But Cam (Hardy) got a big opponent and took that spot. ‘My opponent looks a tough kid. I don’t know a lot about him and there’s not a lot of footage. ‘Hopefully the fight is nice and violent. Obviously I’m not going in to have a boring fight. Hoye had hoped to have fought in between his win against Shanks and his appearance at Shock N Awe. His absence from the cage, however, has allowed him to improve his arsenal. ‘It was an accidental break, really,’ added Hoye. ‘There are not many shows in the summer and I also had a haematoma on my elbow. ‘I sort of tried to get a fight in late September or October. ‘I wanted to be more active but it’s meant I’ve been able to focus on new things and techniques.